Pittsburgh Pride 2013 was an important one. 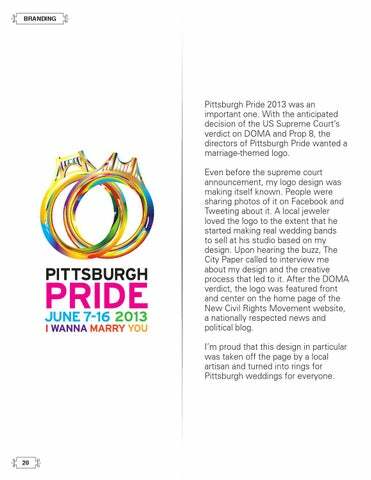 With the anticipated decision of the US Supreme Courtâ&#x20AC;&#x2122;s verdict on DOMA and Prop 8, the directors of Pittsburgh Pride wanted a marriage-themed logo. Even before the supreme court announcement, my logo design was making itself known. People were sharing photos of it on Facebook and Tweeting about it. A local jeweler loved the logo to the extent that he started making real wedding bands to sell at his studio based on my design. Upon hearing the buzz, The City Paper called to interview me about my design and the creative process that led to it. After the DOMA verdict, the logo was featured front and center on the home page of the New Civil Rights Movement website, a nationally respected news and political blog. Iâ&#x20AC;&#x2122;m proud that this design in particular was taken off the page by a local artisan and turned into rings for Pittsburgh weddings for everyone. 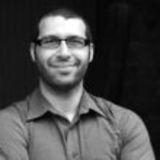 Please enjoy the highlights of my 12 years of design expertise and art direction. If something catches your eye, then let's work together.